Andy and Virginia Bally are pretty amazing. I am a huge fan of their work. Their etched glass piece, above, was my birthday present from Bill this year and is one of my very favorite pieces of art. 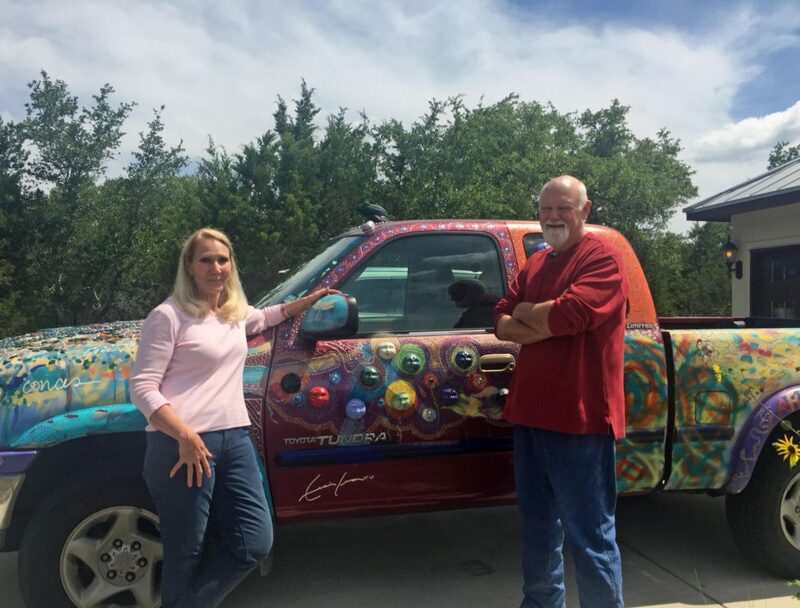 I met this remarkable husband-and-wife team several years ago during a Potters Guild meeting at the old studio.We’ve stayed in touch, and today Bill and I drove out to their Hill Country studio near Canyon Lake. It was a perfect Summer Solstice day trip. Look what greeted us in the driveway (besides Andy and Virginia) as we arrived! 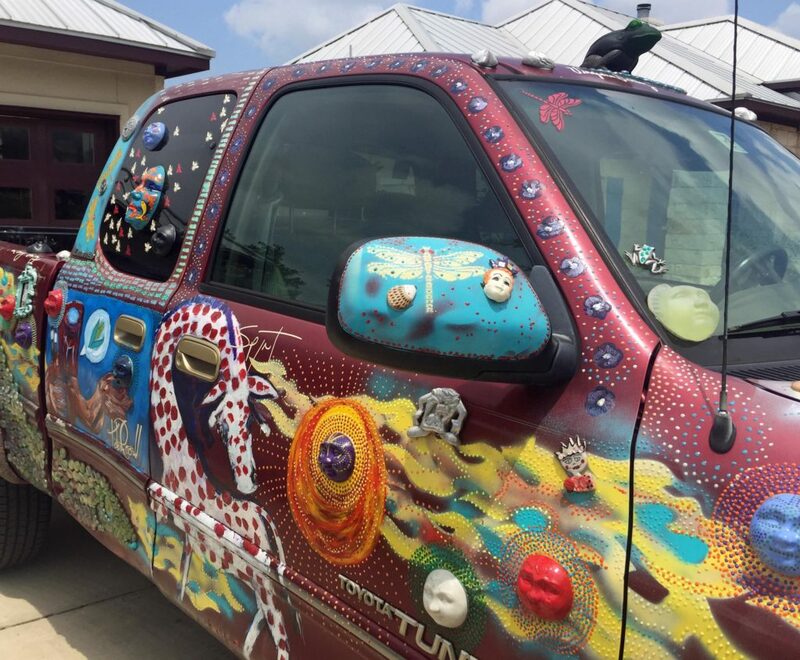 This mobile masterpiece is a work in progress that has been featured in the Houston Art Car parade. The Ballys just keep adding to it, detail after fantastic detail. Their home is a masterpiece of design, as well. I love places that make you feel like you’re inside a collage, and this is one of those places. There are collections everywhere. The Ballys’ shared studio is where the magic happens in clay and glass and assemblage. I took a lot of photos there, and put them together in a video (below) to give you a feel for the scope of their collaborative work. They share the process, although Andy says that Virginia specializes in design concepts and he is often the engineering guy. 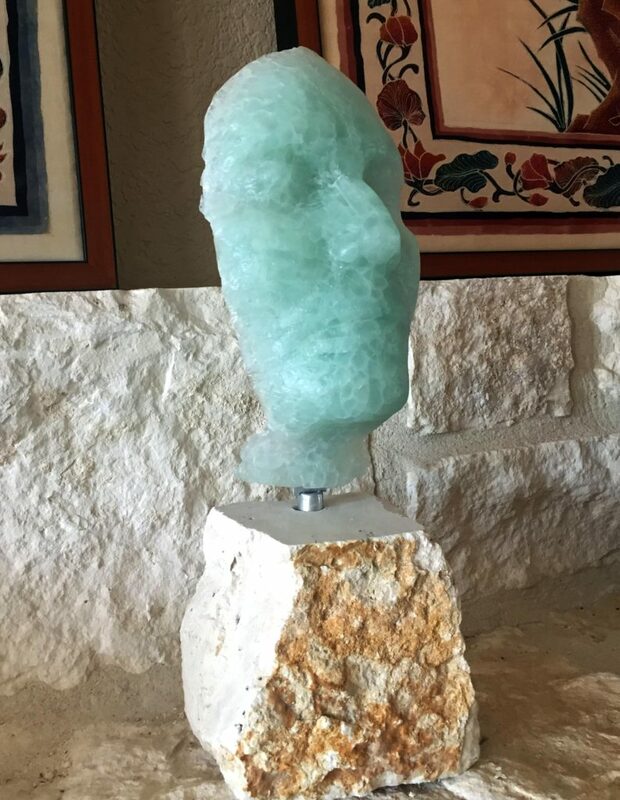 A visit to the Hill Country studio of Andre and Virginia Bally from Lyn Belisle on Vimeo. Andy and Virginia share a love of folk-art inspired constructions. Andy showed us some of their “pocket shrines” in progress. Can you tell why I love their work so much? Their use of faces, their sense of play – it’s very engaging! You can read more about Andy and Virginia here, and while you are at it, check out the face casting slide show on their website. 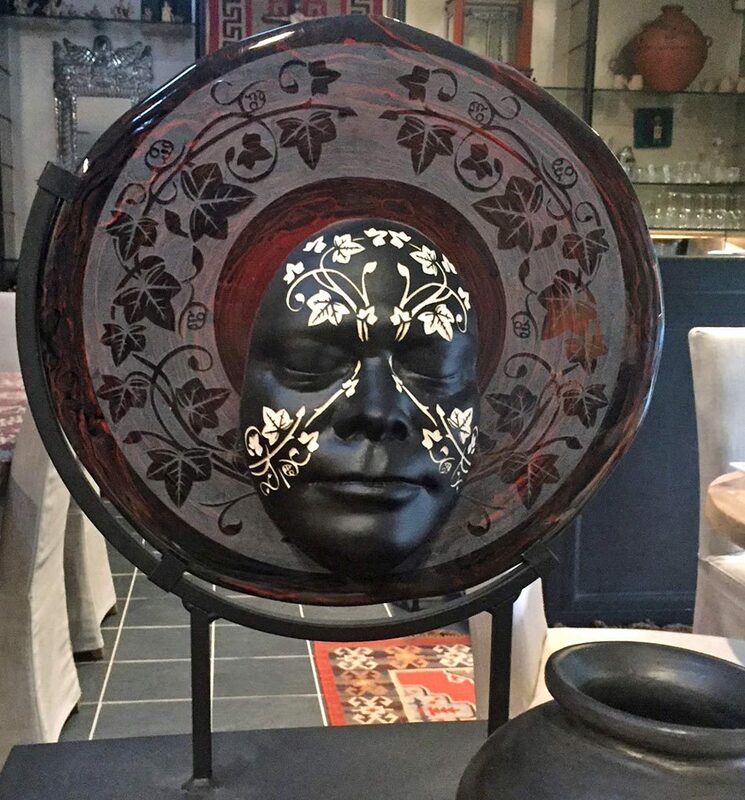 You can see their work at Texcetera in Johnson City, and in collections in Canada, Europe, Northern Africa and the United States. Oh, yeah – and at my house, too! Lucky me to have a Bally original. 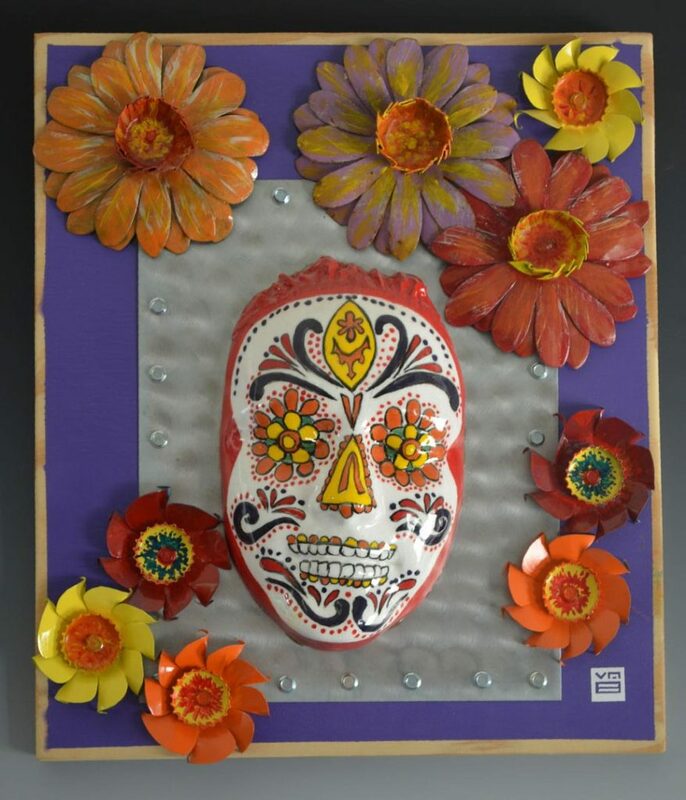 This entry was posted in Inspiration, Other Artists and tagged Andre and Virginia Bally, art cars, ceramics, glass, Hill Country, sandblasting by lynbelisle. Bookmark the permalink. Thanks 4 showing & sharing. Great birthday gift!! Enjoy it! WOW! Thanks for sharing. How fun. — and your piece is amazing!